Highlighting more of the creative companies I met at the Unique LA Show 2010, (so many of them! ), today I'm remembering how intrigued I was when I saw the miniature utopian environments inside clear glass containers or set into the hollows of logs.... had the thought how one could get lost inside any one of these little botanical worlds. And I thought that Chandra herself must get lost in them while arranging and creating them. PLANTED is the emerging business of Owner & Floral Designer Chandra Abel, grown out of (so to speak) her years in her Wedding & Event Floral Design buiness, Chandra Abel Designs. 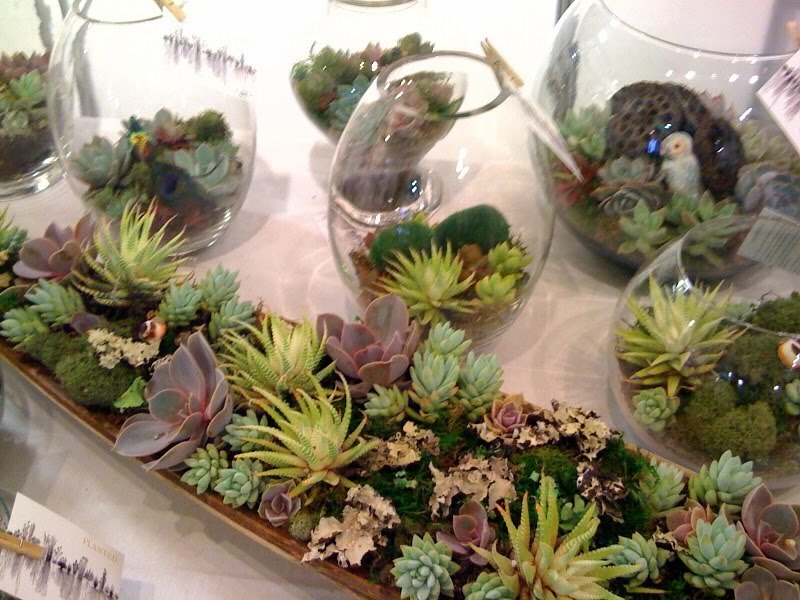 These surely are NOT the old fish tank terrariums I used to see as a kid! With an eye for balance and composition, as well as unusual and delightful individual plant selections, you can further be impressed that Chandra uses only locally grown plants and locally supplied containers, which not only supports other small businesses but has has less impact on the environment (no long-distance shipping). And think of it an added plus that Chandra is as graceful and inviting as her artistic creations.